Well I have never done a marathon!! I did a relay in a marathon and I have done a triathlon! I can remember the thoughts in that! I do have some goals for the year, that will be stretching me!! I also am making a point of finding people who think and believe in moving forward in life, not just existing in what they live. It can be a challenge when many around me are not that, but I find more and more who are, and that is exciting! The woman who you spoke with on the bus on the way to the marathon, spoke words of wisdom, not only for the marathon you were going to run, but for life as well. What a gift that she gave you that day! Holly recently posted…Announcing……. Taking a Break from Exercise isn’t a Bad Thing! Congratulations on your determination to run a marathon. That alone is an achievement. 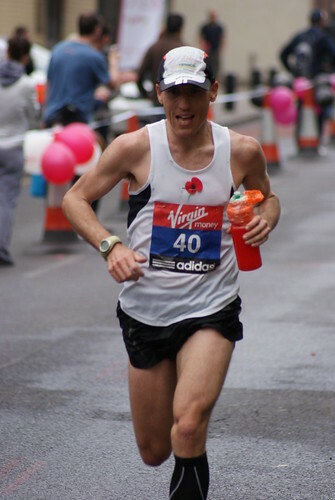 I once came to the start and the finish of a marathon, offering massage and gentle bodywork. It was exhilarating for me to be in the presence of all these runners who had a wonderful energy surrounding them. I have slowly let go of those who bring me down in any way. I have been involved with a weekly mastermind group for several years and it is amazing to observe the progress each of us has made over time. I have also engaged with different mentors, each offering what I need at the moment to help me move forward, steadily toward attaining my goals and living my dream. Erica, feel free to come to my marathon! I’m sure you’d be able to get me out of the pretzel shaped cramps I may be experiencing once I finish 🙂 I’m impressed with the fact that you’ve met with that weekly mastermind group. Would you care to tell us how that came about and how you helped make it happen? I, too, have met with a couple of mastermind groups consistently for the past few years; I don’t know where I would be without them. Congratulations Stephen! I used to run . wow, that was a long time ago, but you are definitely right about a partner making a difference. I have never thought of myself as competitive, but I repeatedly found that when I ran with someone else I pushed myself to go farther faster. I think it’s a bit trickier to partner when you’re an entrepreneur unless your involved with something like network marketing, MLM or affiliate marketing, and there’s a natural built in partnership there. I can’t count the times in the past I shared a small victory with someone only to end up really, really wishing I kept my big mouth shut … now I just write in my journal. I agree with you totally, success is a process that takes work day in and day out. A lot of times those who have been most uncomfortable or unsatisfied with their current circumstances are the one’s who are most successful. All it takes is a little persistent and a passion for something! Dewane, thanks for pointing out the blessing of creative dissatisfaction. I think that being content is a great skill to cultivate, but it’s also helpful to be creatively discontent: to treat difficulties as the beginning of opportunity and greatness. Great post Stephen! So what kind of marathon runner are you? The fun one or the serious one? I love running but not a runner for marathon. LOL. Living like a marathon runner means we should be more focused and disciplined but we have such a love of running that it is by no means a sacrifice,it’s a joy. I absolutely agree with you that life is a marathon…it’s about setting goals, working to improve yourself in ways so as to be able to achieve your goals and moving forward, finding your next challenge. Business is also a marathon of sorts, for while I am barraged with ads and well written sales pitches that tries to persuade me that everything must be done or purchased NOW, the reality is that you are in a marathon race, and the only way to keep moving forward is to work on yourself, build your skills, challenge you beliefs and build a strong foundation. Good luck in your marathon, Stephen. Thanks for the insightful post! Dr. Bob Clarke@Part Time Network Marketer recently posted…Have You Heard? – There’s a New List in Town! Dr. Bob, thanks for the feedback. Part of the marathon also includes building trusted relationships with other online friends and readers. I have reflected on how quickly I will purchase or recommend services from a trusted friend, versus from someone I barely know. I went many years without investing in my personal development and I paid the price for that. Now I am always looking for opportunities. The reward is definitely worth the effort. Kevin, I’m glad that you are now investing in building up your reserve of strengths and talents. I’m sure the people you serve are blessed by your ongoing efforts. I’m impressed my brother! I for one know what it’s like to take on a challenge and complete it. Only a few years ago I set out to climb Mt.Whitney starting from 50 miles north and taking it from the N.W. face. You know… the first thing to do anything successfully is always taking the first step and being committed. For you (and me) putting your credit card on the line was the first part of the motivation and man how did it pay off. Priceless! Dereck, you make a marathon look like a walk in the park! So, did you complete the the climb? That sounds like a great future blog post. Let me know when you complete the post, and please include any pictures! I wish you a lot of fun and success with the preparation of your marathon! Marc, I’m going to remember your mantra: “The way we run, we live”. I like to have some motivational mantras to keep me going through the long stretches. Another great angle on what you said, “The way we do the [seemingly ordinary, small details, private life stuff], we do everything.” It’s a great argument for integrity and excellence in everything we do, down to the smallest detail. Just ask Toyota! It is amazing that you have achieved your marathon goal… one of the most difficult goals I think! I really do try to run and sometimes think about maybe training for a local “run” but I do find it difficult. I can walk really fast though and these days I kind of prefer that to running! However, your analogy is priceless! A social media or internet marketing business marathon is really quite similar to running a road race! We cannot enter it half-doubting that we will succeed; it’s exhilarating to join thousands of others; having a worth goal and finding the camaraderie within a group that has a specific regimen and goals is vital; working with coaches and mentors is important to a speedier success rate; creating a positive environment and surrounding ourselves with like-minded people and removing ourselves from negative people who do not support our goals are all crucial to moving forward always towards our goals in life and in business. This is a great post, worth re-posting again and again as a constant reminder to take the steps, one at a time, toward our success. Thanks tons, too, for the referenced Articles. Loren, I agree about the marathon analogy being helpful. It’s probably been the most helpful analogy as I see to succeed online with building trust, providing value, and also being profitable. Larry Brauner from online social networking first shared the marathon as a great analogy for social networking, and it’s remained with me ever since. You might be interested in a movie I watched last night “Running the Sahara” about 3 men who run 4,300 miles in 111 days across Africa. I’ve just come from reading another blog on community and helping others. Your thought fits so well with that. We do need people who can support us, and people we can support. I’m looking at that. How does one find the right mastermind group? Pastor Sherry, thanks for your support. Some of my best support fans are right here online. I’m proud of you for setting goals that have stretched you. I’m sure, as you continue to grow and learn, you’ll reach those goals. Ah, finding the right mastermind group can be a challenge. I think finding the right mastermind group depends on what your goals are. If you’re looking for a local mastermind group you may want to consider going to Meetup.Com. Or you may want to contact your local chamber of commerce or a business information networking group. I just want to say congrats! That truly is awesome. I’m coming off of a back injury so it’s been tough to get back on track with my exercise routine. I used to run 2-3 miles a day, sometimes more. Now, it’s slow and steady. But at least I’m getting there. Pushing myself, little by little each and every day. Hearing things like this, pump me up to keep pushing harder. That’s awesome that you will be running a 5k. I’ve only ran 1k in my life I couldn’t imagine 5K. I have to agree that it’s better to not try to be and do everything ourselves. Bouncing ideas and getting feedback from other like-minded people helps us all to become winners. I do have my moments when I feel like giving up, but usually all I need is some rest and I am right back to growing and learning. Justin, thanks for coming by! Actually, I’m aiming to run a marathon in about 40 days! We’ll see how it goes. I agree with your feeling of wanting to give up and rest sometimes. I think it’s a good idea to stop and rest, just as walking in the middle of a marathon is fine as well. Thanks for this great brag. I ran the LA Marathon 2 years ago and I learned so much about the importance of big goals, baby steps, and having the right trainers and support. Your blog post has inspired me to create another big stretch goal to train for and reach. Thank you! Monick, I am assuming that you are the one who can brag: you’ve already accomplished the highlight of the LA Marathon! I have yet to attempt my feat 🙂 What’s your next stretch goal going to be? Rick, the most successful people, I have found, seek out coaches in their lives. Kudos to you! Having an opportunity to join a marathon is really a great achievement especially if you become the winner. Being a winner really helps to boost your confidence to yourself and strive more to become successful and win during the next marathons or events that you want to join… And really, your post is a great inspiration to us so thanks a lot! Tony, thank you very much for the positive feedback. Hey Stephen, I too am running my first half-marathon this November in Nashville. Did not realize you need to take supplements and hydrate DURING a race. Still got a few things I need to do before the race obviously besides just run. Lol. Great info, thanks. Hans Schoff@ creating wealth recently posted…Wealth Secrets – What Does Running Have to Do With Money Making Secrets? Oh, yes, Hans! You’ll be amazed at how much more easily your run will become with those supplements! You might want to read some articles online, like at coolrunning.com, on best practices for preparing in the next two months. Congrats to you on your goal! I ran my first half-marathon last year. It wasn’t as hard as I expected but it was a great accomplishment since, up until I suddenly decided to do it, I hated running. There so many lessons to learn while you are out there alone with your thoughts. My goal is to run an ultra marathon within a year and a half. Fantastic job of relating training to life! Marathon runner ! Congrats ! :-)) Frankly, I always admire those sportsmen/women when they won medals. It always tells me that they have the right thought and they were trained perfectly well mentally and physically before the competition. They knew where they are and what it takes for them to get to the finishing line. Their effort to develop their skill is sharpen day by day. Thank you for this article and again, I congratulate you for sharing all the must have great attitude here in order to succeed. Such attitude can apply in everything we do. Pearly, thanks for the encouraging words! I admire everyone who is online as well, making the efforts to learn and grow as they improve the value of their offers to others in their niche. About to start training for Miami. Agree that it’s all about progression! Congrats on the Chicago marathon – it must have been epic to run with such a large amount of people, most of who are pretty good runners! I completely agree with your tips here. Running in a group or with a training partner is one of my favourite parts of training and I think that if i didn’t run with others then I would really suffer over any training distance over a half marathon. I have done marathon training, too, and I think the most important thing I learned was to put your feet on the ground and just keep them moving in a consistent, daily manner. This is called training. It’s hard… impossible… in the beginning. But if you show up every day and do it, as your training plan guides you, a quick look back a few months later will AMAZE you!